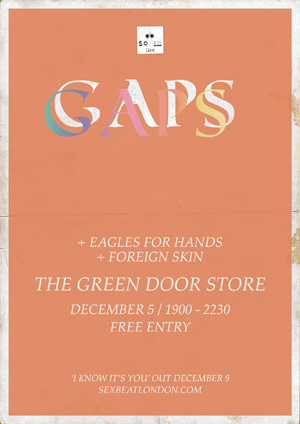 On Thursday Night, GAPS launch their new single I Know It’s You with a gig at the Green Door Store. Support comes from Foreign Skin and Eagles for Hands. Thursday is also December’s Source New Music at the Dome Studio Theatre, headlined this month by Rum Committee, with Mok, Neon Saints Brass Band and Barcode also on the bill. Meanwhile, over at the Brunswick Tim Keegan & The Quiet Lifers are playing at the Brunswick. They’ll be previewing tracks from their forthcoming album The Long Game, as well as other material from their back catalogue, a tribute to Lou Reed and maybe something a little more festive. As if that wasn’t enough, at the Blind Tiger there’s a Beatabet takeover with Le Juki, Bryony Bird and Collectress. 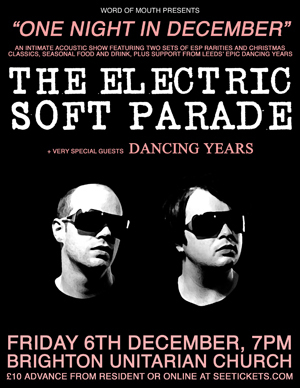 Friday night sees The Electric Soft Parade play their Christmas Show at the Unitarian Church. The band will be playing two sets – an acoustic Electric Soft Parade set of rarities and covers, and an second set of Christmas songs with an expanded band. There’s promise of mince pies and mulled wine too. 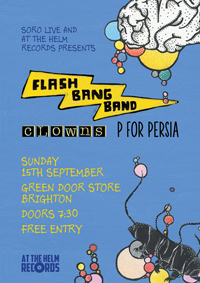 Normanton Street and Phoebe Freya are launching their new single at the Green Door Store, and carrying on with an afterparty at Brighton Arts Club after 11. Support at the Green Door Store comes from Alice Amelia, The Remedy and The White Bicycles. As if that wasn’t enough for Friday Night, Hypnotised are supporting the Godspeed / Silver Mount Zion side project Esmerine at Saint George’s Church. There’s plenty to choose from on Saturday too – Eliza Jaye is playing at the Ranelagh, House of Hats, Jacko Hooper and Fiddes Smith are at the Brunswick, and Two Jackals are at Coalition. Finally, on Sunday, Sealings play at Sticky Mike’s Frog Bar, supported by Shudder Pulps, Keel Her and Witching Waves. In the meantime, we’re off to see Lion Bark at the Hope tonight.